My Car Is All Worn Out. What Should I Do? I need two new cars(used cars) but I don’t know if I should fix these old cars or trade them in and buy two used ones. My 2007 Kia Optima has 165K miles on it and won’t pass inspection — it needs a catalytic converter and new tires (maybe $1500?). My ex-wife has a Kia Sedona with 100K miles and needs new a transmission (Maybe over $3k). These cars are paid off and we both desperately need cars, more so, me. With no car loans right now, I barely pay my bills every month. And I only have a little over $2k in savings. I also just had a car accident that was 100 percent their fault and received a check for $1500 for damages. My ex-wife does not do a lot of driving but I do a ton unfortunately. Do you have some financial advice of what my best option to do is for this very stressful situation? 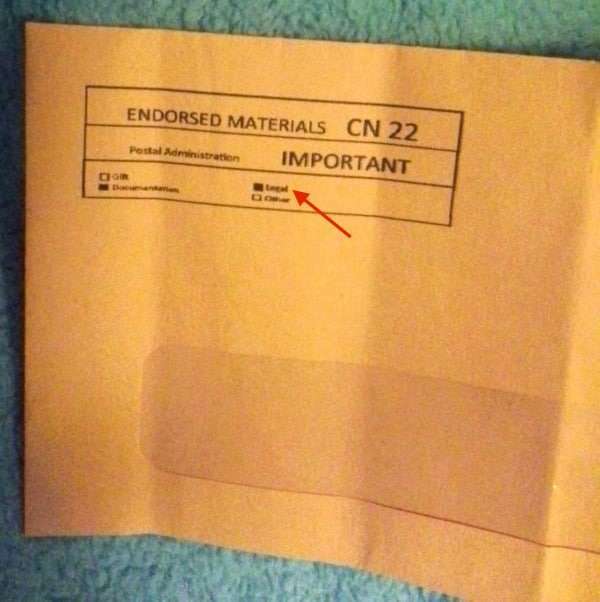 Well, you gave me a couple of important clues. You said you currently do not have any car payment but you are barely getting by and have little in savings. I also get the impression you are not living lavishly and don’t have much to trim in the budget. So we have to piece together a solution that does not increase your transportation costs and still allows you to have reliable transportation. I’m not sure that’s possible. Both of your cars seem to be cared for but have worn out critical components. When vehicles reach the end of their affordable or useful life the options are to fix them up or ditch them. They reach a point where fixing them just gets you a free membership in the Repair of the Month club. I could not help but notice that you are trying to come up with a solution for you and your ex-wife. You know I’m pretty good at what I do but figuring out an answer for two now separate and divided households is beyond my pay grade. I’m a big fan of buying used, rather than new cars but your situation is a bit different. In your case, with limited additional resources, I like new cars with good value and awesome warranties. New car financing from manufacturers can be obtained with really great rates and here is how to do that. A new car will give you the financial protection from a major auto repair over the next few years. Sometimes the advice you always hear about never buying a new car just doesn’t apply to every situation. Not long ago I actually had a chance to borrow and drive one of the least expensive cars available today. Sure, it was laughingly small but all four of us adults fit in the car and it was a surprisingly brisk ride. In fact, I even took a picture of the Chevy Spark we borrowed because it was so unusual. The car starts at $12,170 (I know, who ever pays the base price?) and the U.S. Department of Energy reports the car gets 30 MPG city and 39 MPG highway. 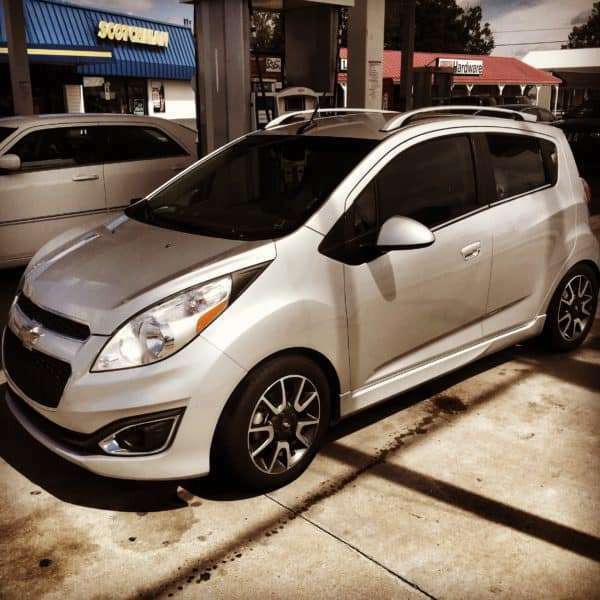 With your insurance check in hand and your beater to trade in there might be a deal to be had on this or a similarly inexpensive car like the Nissan Versa, Mitsubishi Mirage, or Ford Fiesta. So let’s look at the costs and cost savings to see how buying you a new car might make sense and cents. According to Fuelly.com, drivers with a 2007 Kia Optima like yours generally say their combined fuel milage is in the 28 MPG range. Real drivers in the 2015 Chevy Spark are reporting 36 MPG. Now you say you drive a lot. In my book a lot would be 2,000 miles a month. Hey, I’ve got to use some number for the calculations. At 2,000 miles per month your Kia would burn about 71 gallons a month while a car like the Spark would burn 55 gallons. At current prices that would save you about $34 a month and if fuel prices go up the savings are even bigger. Chevy is offering zero percent financing and if you qualified your payment, based on $13,000 would be $180 a month. But really it would be $146 a month if you factored in fuel savings. You’d have to check on what your insurance costs would be. According to Chevy, the Spark has a two-year or 24,000 mile scheduled service program so you wouldn’t have to pay for any service for the next year or so based on your driving. It also has a five-year or 100,000 of roadside assistance and powertrain warranty. Look, I’m not suggesting you should blindly run out a buy a new car. But what I am suggesting is that we have to look at a solution where you are not pouring good money after bad and whatever you decide to do allows you a better chance of less transportation problems and costs moving forward. And I’m also not saying you should buy the Chevy Spark. There are several cars to choose from in the entry level range. While a new car does increase some of your costs it also reduces some and most importantly, gives you a better chance of having reliable transportation for a longer period of time with a manufacturer warranty to protect your financial risk of major repairs. As far as your ex-wife goes, have her write to me and I’ll tackle her situation separately. This entry was posted in Uncategorized on October 2, 2015 by Steve Rhode. I thought this article Kelli Clevenger shared with me was awesome. It opens the possibilities for people who want to start their own business and who love pets. But one lucrative opportunity isn’t in there, poop scooping. I know a couple of people who have really cleaned up by cleaning up. This entry was posted in Uncategorized on August 28, 2015 by Steve Rhode. The Department of Education has just released guidance on how it will handle bankruptcy discharge requests for government backed student loan debt. And while the guidance is helpful, it’s also a bit disingenuous in that it places the burden on students who believed what schools and colleges sold them as a smart financial move. The guidance wants to provide a balance between collecting on student loans except where the loans would pose an undue hardship on the debtor. The Department of Education desires to find its balance in collecting debts versus allowing debt to be discharged. What this formula misses is the inequity of the indebtedness to begin with by schools, for-profit and nonprofit, pushing loans on consumers. It’s almost like a game of “tag, you’re it” where the consumer is the one holding the bag or hot potato. It’s too early to see how many lenders “may” elect to follow this advice. But having this in writing is a good tool for consumer bankruptcy attorneys. To read more about how to eliminate federal and private student loans in bankruptcy, click here. Here is what the Department of Education has to say about what constitutes and undue hardship and thus a consent to allow the student loan debt to be discharged. Whether a debtor has filed for bankruptcy due to factors beyond his or her control and the impact such factor(s) have on debtor’s ability to repay the student loan debt. Which includes a divorce resulting in diminution of family income, which will not realistically be reestablished. Here is an actual example of when the Department of Education feels bankruptcy discharge should be considered. While the Department of Education has laid out a course more bankruptcy attorneys can follow to seek a discharge of student loan debt as an undue hardship, it will take time for a smooth process to be developed. But even if the government does not allow for a total discharge of the debt, there exists an opportunity to “agree to discharge of a portion of the amount owed” and allow the consumer to get a bit of a bankruptcy fresh start. This entry was posted in Uncategorized on July 9, 2015 by Steve Rhode. 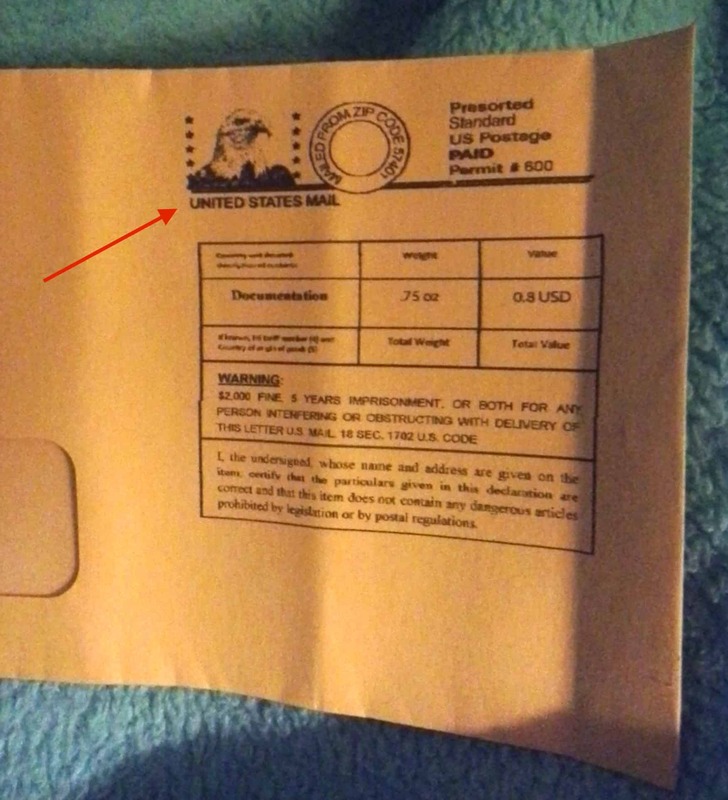 The envelope is even markered Legal and Documentation. The letter leads off with a headline that if people didn’t understand or miss the “RE:” would make it appear to be from the Department of the Treasury. As with many of these mailers that I write about, there is just enough to appear to be one thing but a disclaimer it is something else. And I challenge anyone to determine who the company is behind this mailer. They identify themselves as Assistance Center, can there be anything more generic? Well there might not be a fee of the initial consultation but they don’t say there are no fees at all. To me that means there will be fees. Next is an odd line, “You do not need to be late to qualify for this hardship program, however late payments will expedite the qualification process.” What hardship program are we talking about? If it is the IRS publication 4681, it does not say a qualification for income tax on forgiven debt is predicated on delinquency. So is the ever generic Assistance Center calling their pitch a hardship program? An Immediate Reduction of Payments – But this is typically accomplished by the commissioned sales rep of such marketing outfits asking what you can pay and then setting that as your payment. It is NOT a creditor approved reduction and generally tosses you into delinquency, collections, and potential lawsuits when you pay less than agreed to the creditor. And is the creditor even going to get paid? In most generic settlement program they will stop getting payments so the debt can be attempted to be settled. A Reduction of your overall Debt of up to 68% or more – There is no support to this statement and the Federal Trade Commission really frowns on this sort of claim. See this action against DebtPro 123 by the FTC over similar claims. Complete Elimination of Your Credit Card Debt – Again, this seems like a problematic statement that conflicts with the Telemarketing Sales Rule and limitations it makes on performance claims. For example, how many people who signed up for this program actually eliminated 100% of their debts. Actual performance results of such programs in general paint a much different picture. Click here to see overall results. Finally put a Stop to Collection Calls and Letters with Debt Satisfaction – I think this might be my favorite line of all because guess what, collection calls stop for everyone when the debt is satisfied. The following statement in the advertisement is interesting. Earlier the letter said you did not need to be late to qualify for the “hardship program” but here it says you need to call immediately “to avoid any possible legal action from your creditors.” What legal action is a creditor going to take against someone who is current on their bills? The answer would be none. In closing they say, “You need, and will receive, the full support of our organization to put this behind you for good.” Only one problem with that. If they are so proud and supportive then why not actually disclose who they are and where they are located? 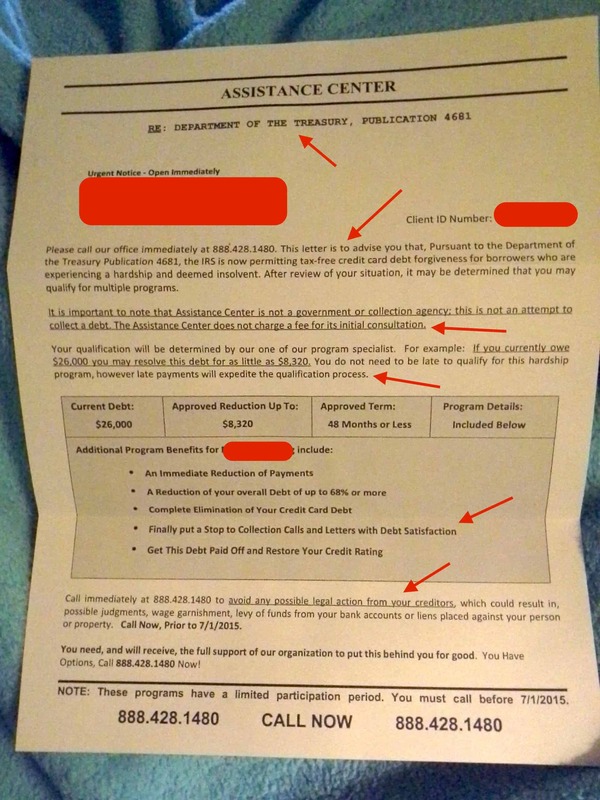 I would advise anyone who gets such a letter to follow my free guide on how to check out a debt relief company. See The Ultimate Consumer Guide to Checking Out a Debt Relief Company Before You Sign On the Line before you leap. An open and honest company won’t hesitate to answer the questions in that guide. This entry was posted in Uncategorized on June 3, 2015 by Steve Rhode. This entry was posted in Uncategorized on April 30, 2015 by Steve Rhode. I recently called to ask if I could get a lower pay-off amount as the original loans were 32K and now they are up to about 64K because of deferment and interest. They said no and I believe these may have been private loans. My conditions have changed I was born into Islam however never knew much about my religion. Since 2012 I have been learning more about my faith and it is strictly forbidden in my faith to have dealings with interest. I am offering to pay off the original amount I owe however due to religious reasons would like them to recognize that my awareness and conditions have changed from the time of originally accepting the loan with Citi-Student Loan Corp and not even with them at Sallie Mae. Can I get the interest wiped out and close this account and case with just paying the original amount borrowed? I am in the Seattle, WA area are there attorneys that you can direct me to that can help? Yes, I am very familiar with the issues surrounding the Islamic approach to interest. You might enjoy reading Debt & Religion: A Look at the Islamic View of Debt With Imam Asal. Asking any lender to adjust their terms and conditions after the fact for religious reasons is just not going to happen. You’ve also learned a painful lesson, the damage caused by deferment is enormous. Most people think it is an innocent time not to make payments and get a payment vacation. In fact it just puts the debt in turbo and the interest causes the balances to explode. I have observed Sallie Mae, now Navient, settling more loans, click here, but you’ll need expert assistance to get yourself in the right spot to settle them. If you just call up and ask, they will generally say they don’t settle. However, people are receiving offers in writing from Navient without asking when they are significantly delinquent. The next issue is if you will have the money on hand to settle. You’ll need to either need to payoff the settlement in one payment or three or four. But even considering all those facts above, if your faith is guiding your repayment then you’ll have to seek wise counsel on how to deal with what the the Imam told me. He said, even those that borrowed with interest, are obligated to repay their entire debt and if they don’t they will prohibited from entering paradise when they die. How you overcome that little issue is above my pay grade. This entry was posted in Uncategorized on April 22, 2015 by Steve Rhode. I loved the article Stefanie O’Connell submitted to me through the Personal Finance Syndication Network that I had to share it with you. My mother grew up in poverty, raised by a single-mother in a non-English speaking household in New York City. Without the slightest hint of today’s buzzword – “privilege”- in her upbringing, she worked and earned herself a scholarship to Barnard College and later, Columbia Business School, paving the way for her unprecedented career successes. I, on the other hand, grew up drowning in privilege. Every night my parents would sit down with me and review my homework. If I wasn’t doing well, I would be sent to tutoring after school. If I was struggling in a class, they’d help me with extra credit projects. I was signed up for so many extracurriculars it was like my parents were challenging colleges to reject me. I had just about every resource at my disposal to develop my skill sets, learn to problem solve, and learn to learn. That privilege is what afforded me the opportunity to pursue something as impractical as theater and end up broke. It’s also the privilege that allowed me to apply my critical thinking and problem solving skills to eventually break free of broke. When it comes to poverty, despite my financial expertise and very real experience of limited income, I still feel at a loss for giving advice. Knowing my privilege also makes me very cognizant of the fact that I have no idea what it means not to have privilege. Not to have income is not the same as not having privilege. I’ve been without income, but never for a moment have I lacked privilege. Never for a moment have I not been equipped every skill I needed to find appropriate information, resources, and connections to solve whatever challenge I was facing. Never for a moment have I had to face the risk of sleeping on the street or going hungry or having nowhere and no one to turn to. My network of support – not necessarily monetary, but human- is so vast and valuable that I can afford to take big risks – like pursuing theater, traveling the world, and starting my own business. If I fail miserably, I know there’ll always be a couch to crash on. When I think about the value of my privilege, I find it comes down to learned skills and a network of support more than anything else. By redefining privilege in this way, I also start to understand how my mom became such a raging success. Yes, my mother grew up without the benefit of high- or even subsistence-level income, but she grew up with a remarkable model of work, my grandmother (though low earning, hard working), and high expectations of achievement. She also had a vast community network comprised of fellow immigrants that, despite severely limited resources, had an insatiable appetite for “something better”. While she may have faced great hardships, my mother had extraordinary models of what was expected and what was possible in her life that made her very connected to the potential for opportunity and success. In fact, that entire community she grew up with “lifted itself” from poverty in one generation. So what’s the barrier for those in poverty now to do the same? It’s not a monetary construct, it’s an opportunity construct. Models for success have segregated themselves from the people who need those models most. My mom doesn’t live in poverty anymore. She moved to Connecticut to send her kids to better public schools, an understandable decision for which I am grateful, but one that according to research by Robert Putnam, has lead to the growing opportunity gap between rich and poor. Upper-middle-class families separate themselves into affluent suburbs with separate public schools, and as a result, poorer children don’t get the necessary access to the same amenities and exposure to the same models of achievement. The end result according to further research by Rebecca Diamond – an ever-growing income gap between high-skilled and low-skilled workers, which no doubt perpetuates privilege (and lack thereof) even further. Lack of privilege is isolation from opportunity. This article by Stefanie O’Connell first appeared on The Broke and Beautiful Life and was distributed by the Personal Finance Syndication Network. This entry was posted in Uncategorized on April 14, 2015 by Steve Rhode.